In a poorly ventilated building, a wide range of problems such as mold growth and condensation can occur. Either of these or a variety of other potential problems can cause damage to anything that is stored within the building. The problems can be exponentially worse if a poorly ventilated steel building is a part of a larger commercial enterprise such as an arena or agricultural complex. Creating the right air circulation is the best way to ventilate your steel building and safeguard its content. Keeping the air moving is easy when you install a louvre vent. Louvre vents are found in a wide range of buildings including school classrooms. It’s usually places below a window sill on the exterior. On a steel building, the unit is more likely to be situated on the roof to maximize its working potential. Wherever the unit is positioned, the way it works is the same – fresh air is drawn in from outside through a vent on the exterior wall or roof. Air is also drawn from inside the room, or steel building. This is known as the return air. The flow of air through the vents is controlled by the angle of the louvers. The louvers are situated at the base of the louvre vent. In addition, the louvre vent contains a filter that can remove allergens and particles from the air. The ability to move air around successfully and to suit individual needs is only part of the louvre vent’s appeal. A louvre vent unit can also contain a heating coil that can heat or cool the air that is ejected through the air diffuser by the unit’s fan. Additionally, louvre vents that provide air conditioning are also available; these have a cooling coil and a drip pan to collect the condensation. The entire unit is controlled by a thermostat that is located inside the building. The size and dimensions of the louvre vent mean that it can be used in any size metal building without its performance being affected. 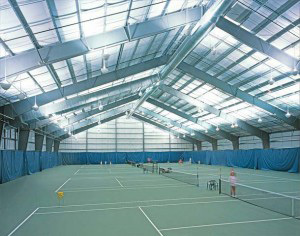 It can also be used for any shape of a steel building, including a flat or a pitched roof. A louvre vent is perfect for your steel building because of its ability to regulate the flow of air and temperature in the building. You have greater control over both of the parameters than you would with any other ventilation system, which allows you to utilize your steel building for a wider range of uses without the worry that equipment and supplies will be damaged or destroyed. At Toro Steel, our louvre vents are designed with our without dampers and for continuous runs. Contact us today for more information about steel building louvre vents and other roof accessories.